How do you create a new kind of Park, one that is more than a relief to the built environment? While this can be a sustainable oasis, a place of pleasure, activity, and reflection, is it possible to create a park that will generate new ways of thinking about our environment that can affect the whole region? 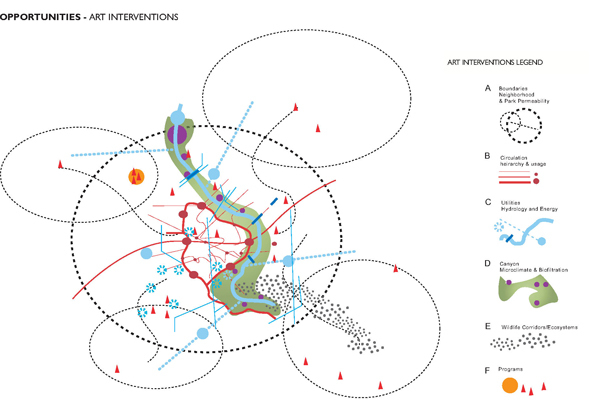 The Park as Living Laboratory is a concept and program developed by Mary Miss during the Master Plan phase for the Orange County Great Park in Irvine, California. Miss and landscape architect Ken Smith were principal designers of the competition winning scheme for this 1,300 acre park on a collaborative team that included environmental ecologists Steven Handel, architect Enrique Norton, landscape architect Mia Lehrer, environmental engineers Buro Happold and Fuscoe Engineering. Art and Artists can have a major role in making a park that is a place of our time. They will be leaders in establishing the Park as Living Laboratory, a place that is experimental and evolves over time. This is where new ideas about environmental and social sustainability can be reflected upon, investigated, and built over the next 5, 10, 20, or 50 years. The role of artists will be to make sustainability a tangible experience, doing projects that might involve energy, water, history, or meeting places. The goal is to arouse the interest and curiosity of visitors, making these pressing issues of the 21st Century accessible. The park becomes the place where a new relationship between the public and the natural environment can be developed. How can people come to understand their individual roles in maintaining the fragile environment in which they live, work, and play? The park should be seen as a field of opportunity where new ways to create vital public spaces within the larger park can be explored. Through these spaces, all communities will begin to develop a sense of ownership of the park. The park will be a place where the multiple histories of the place can be acknowledged and revealed. Who were the earliest occupants of the area? How can they be acknowledged along with later inhabitants? To implement these ideas the goal will be to create a Research and Residency Center. This will be a place where artists can collaborate/engage with scientists – botanists, hydrologists, biologists, – and social scientists – environmental ecologists, sociologists, anthropologists. Through these collaborations, artists will have the opportunity to investigate and research in detail an issue such as storm water run-off or how to design a way to show five different types of alternative energy in the park; or how to engage people with a public space who have previously not been accommodated. Potential issues that might be addressed: programming, specific sites, the archaeology of the area, the major structures in the park, hydrological systems, or communications. The work might take the form of prototypes, temporary installations, permanent works, or theoretical investigations. The idea is to design a process to engage artists in collaborations to address and reveal some of the most complex issues of our times. Over the years artists’ and designers’ work will create a place where something new is always expected. This is where the individual is directly engaged with otherwise abstract issues about energy or the environment. It is where a great visual richness of experience is available and where a new awareness of the relationship between the built environment and the natural world is forged. The Park as Living Laboratory will insure the Orange County Great Park is a vital, engaging public space that has the potential to affect the entire Southern California region. This will be a place that helps us define our future.